Shrove Monday (the Monday before Ash Wednesday) is the highlight of the Shrovetide season in Germany, Denmark, the Faroe Islands, and some other countries. It is also known as Collopy Monday in the UK, Rosenmontag (Rose Monday) in the German-speaking countries, and as Fastelavn in Denmark. In Christianity, Shrovetide (Pre-Lenten Season) is the period when people prepare to the liturgical season of Lent that begins on Ash Wednesday and ends before Easter Sunday. In many countries across the world, it is associated with Carnival that typically occurs during February or early March, depending on the date of Easter. 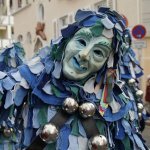 The carnival season in Germany begins on November 11, but the “street carnival” starts on Fat Thursday and culminates the next Monday, known as Shrove Monday or Rosenmontag. In contrast to Germany, in Austria and some other European countries, the highlight of the carnival is Shrove Tuesday, widely known by its French name Mardi Gras. Rosenmontag is not a public holiday in Germany, but schools are typically closed on this day. Many businesses tend to give employees the day off on Shrove Monday and sometimes even on Thursday before Rosenmontag, granting them a long weekend. Shrove Monday celebrations in Germany typically include parades and general public displays with floats. In many cities, it is customary to make satirical floats making fun of politicians and the themes of the day. People dress up in fancy costumes, dance and drink. The celebrations wind down on Shrove Tuesday and end on Ash Wednesday. In Denmark, Carnival is typically celebrated on the Monday before Ash Wednesday, and it is known as Fastelavn. This term comes from Old Danish and means “fast-evening”, i.e. the evening before Lent. Like in many other European countries, Fastelavn celebrations include processions and dressing up in costumes, although it is now mainly a children’s activity. An interesting tradition associated with Fastelavn is called “hit the cat out of the barrel” (slå katten af tønden). It involves a wooden barrel filled with candy (similar to piñata) that has an image of a cat on it. Children take turns hitting the barrel with wooden sticks, aiming to knock down the bottom to make the candy spill out. A typical Fastelavn treat in Denmark is fastelavnsbolle. It is a round sweet bun covered with icing. It might also be filled with pastry cream or a whipped cream mix. In most bakeries, Fastelavn buns are sold throughout the entire month of February. In the UK, Shrove Monday is referred to as Collopy Monday after the traditional dish of the day that is usually eaten for breakfast. It consists of collops of bacon (slices of leftover meat) topped with a fried egg. In east Cornwall, people usually eat pea soup on Shrove Monday and therefore call the day Paisen Monday or Peasen Monday. In many Caribbean countries, Shrove Monday is the opening day of Carnival, thus it is referred to as Carnival Monday. It involves parades, but on this day they are typically not in full swing yet. In New Orleans, the day is known as Lundi Gras (Fat Monday), similarly to Mardi Gras.